Cash shortages are said to be worsening in Harare, with reports that banks are now planning a series of measures to limit withdrawals. An investigation by SW Radio Africa indicated that some companies were even failing to pay workers their wages as they cannot withdraw large sums of money from their corporate accounts. 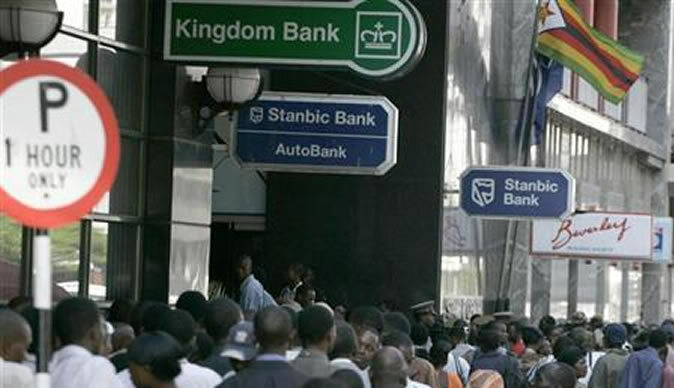 According to Harare-based correspondent Simon Muchemwa, indigenous banks have been the hardest hit. “Since the elections banks have experienced sustained withdrawals as individuals and companies respond to the uncertainty that accompanies a ZANU PF win. “A month after the election result there is still no Cabinet in place and such a situation doesn’t inspire any confidence at all so people are taking out their money and there are few deposits being made,” Muchemwa said. In response, some banks are now limiting withdrawals to amounts ranging from $100 to $500 per day. “Before the election, companies could withdraw as much as $20,000, but that is no longer the case, to the extent that some have been struggling to pay salaries. “A director at one property development firm indicated that since July they have not paid wages in full because they cannot access the money from their bank. “In some instances banks are asking some depositors to bring police clearance if they want to withdraw large sums, as a way of buying time because some of them fear going under if the panic withdrawals persist. “And this makes it very difficult for people with children of school-going age to pay school fees, rent etc, and some parents I spoke to whose children attend boarding schools, said they have not managed to pay tuition fees,” said Muchemwa. Following the announcement of the July 31st poll outcome, the Zimbabwe Stock Exchange (ZSE), suffered big losses amid reports that the ZANU PF government was going to re-introduce the Zimdollar. Despite Reserve bank Governor Gideon Gono going around the country to try and reassure investors and depositors that this was not the case, it appears there is still skepticism about what ZANU PF will do next.